If you read my last post, you saw we’re building a house and that we close in a couple weeks – eeee!!! You may also have noticed the blog has taken a back seat while we’re in transition. We’ve been so busy that even grocery shopping has been cut back, leaving me to get real creative with what I can scrounge around for in the pantry and fridge. And that’s exactly how these tacos and I came to meet. 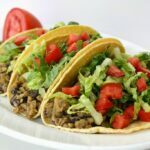 A taco craving that needed to be satisfied, and a lacking pantry to do it with. I’m so glad that challenge was presented because we ended up loving these! The filling is packed with flavor, protein, and fiber. Plus you can change up the spices however you prefer. (I love the addition of smoky chipotle powder.) Better yet, the leftovers can morph into a taco bowl for my husband’s work lunch. 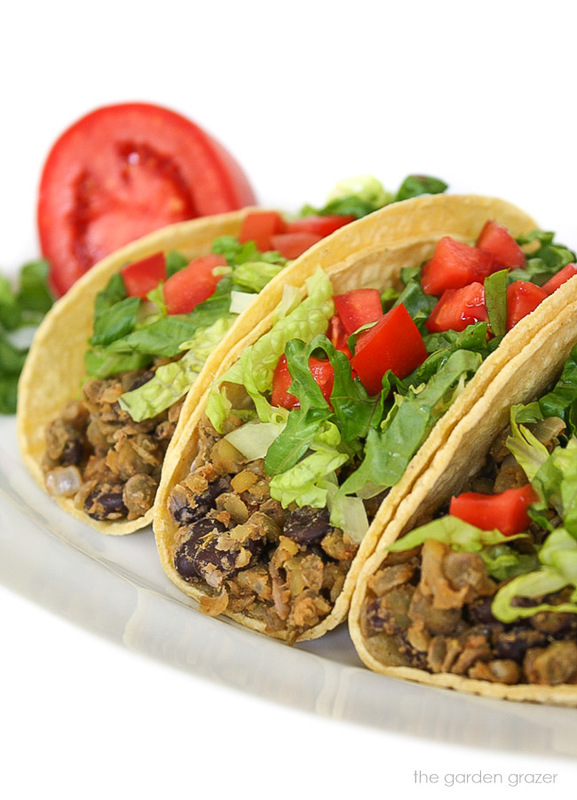 Simply mix together the filling, toppings, and small pieces of corn tortilla for an easy, no-hassle lunch to reheat. Update: we’ve also used this mixture on nachos… delicious!! 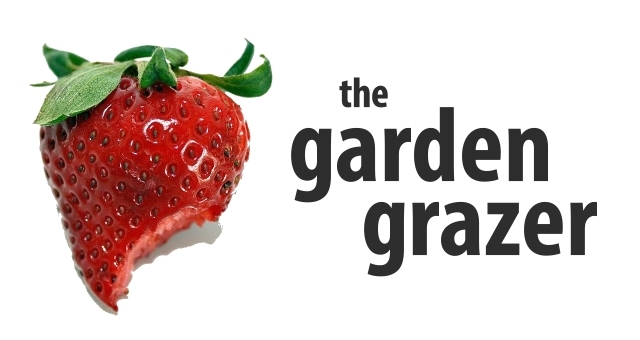 Come join The Garden Grazer on Instagram 🍓 and share a pic if you make this! I love seeing what you guys cook up. Tomato, lettuce, corn, dairy-free cheese, salsa, guacamole, cilantro, etc. Cook lentils according to package directions and drain. Meanwhile, dice onion and mince garlic. In a large skillet over med-high heat, sauté onion for about 7-8 minutes. Once onion is translucent, add garlic, cumin, chili powder, and salt. Stir and saute for 2 minutes. Reduce heat. Add cooked lentils (drained) and black beans (rinsed and drained). Mash mixture and stir to combine. Add salsa and vegetable broth. Stir and heat for about 5 minutes. Add more vegetable broth as necessary to keep it a creamy, moist consistency. Taste and add more salt or seasoning if desired. Spoon mixture into a tortilla with toppings of choice. If you're short on time, you can use two 15 oz. cans lentils instead of cooking your own. Try this mixture in taco bowls, or nachos as well! Mmmmmmmmm! I do love tacos. I came to them late, but now I'm converted! Hi Jacqueline! Glad you came around on tacos 🙂 I love them too! Wow – these look delicious! 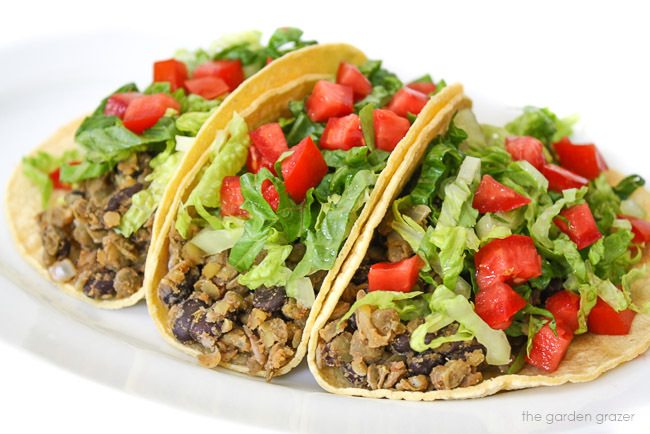 mmm i love taco, these looks great! making these tonight! can't wait! This recipe was amazing! It was so simple but tasted fresh and healthy. Exactly what a busy mom needs during the week, my 3 year old devoured his taco, which is a rarity! This will definitely become a staple in this house. Thank you! YAY! I love meals that please the entire family – kiddos included! 🙂 Makes it much less stressful come dinner time. So glad you both enjoyed these! Thanks for the sweet message! Could this mixture be frozen and reheated as necessary? How do lentils do with freezing? 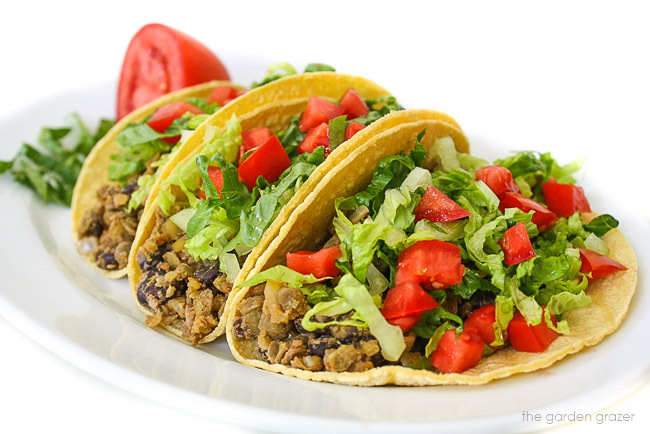 Just ran across your webpage yesterday (from Pinterest posting of your 12 Vegan recipes) and made the black bean taco mix for dinner – it's great! Thanks for sharing! Hey Jeff – NICE! Glad you enjoyed these, thanks for letting me know. Have a great weekend! Hey Vicky! Yay!!! So fantastic to hear you're enjoying them for your taco nights 😀 We love them on nachos too!! Thanks for the sweet message, have an awesome weekend! Excellent replacement for ground meat dish.Anyone would love the texture and freshness of this go to anytime meal. Hi! Any kind of jarred salsa or your own favorite homemade salsa will work 🙂 Grab your favorite! I'm new to lentils – what kind (red, green?) Thanks! Hi Katie!! For this recipe I use brown lentils (they're also the most common and easy to find in the store) 🙂 Sorry that wasn't more clear – I'll update the recipe! Hope you enjoy your first lentil experience, I'm such a huge fan of them! <3 Let me know if you have any other questions! Wishing you a very happy new year!! Is there a way to keep these warm? I’m doing a taco bar with meat in crockpots but wasn’t sure on a good way to keep these warm during a party.